Gujarat chief minister Narendra Modi's "Chai pe charcha", which began in Gujarat towns on February 12 evening, has made national headlines. It seeks to counter Congress propaganda, which had sought, at one point, to ridicule that Modi, during his youth, worked as a boy selling tea at a tea stall. However, a prominent anti-Modi campaigner Shabnam Hashmi has created a stir in the social media by claiming that the BJP's prime ministerial aspirant "stole" the idea floated by the voluntary organisation she heads, Anhad, bout 14 months back. 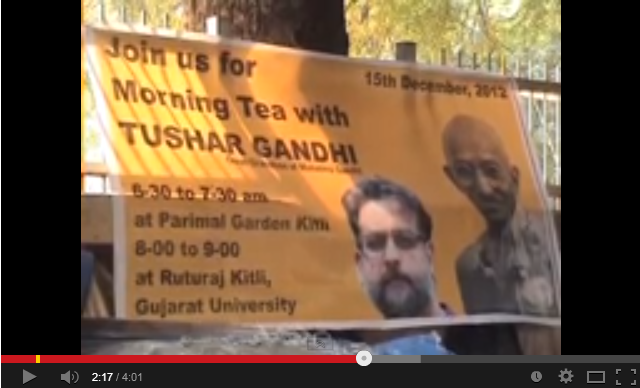 Ahnad had organised a "Chai pe charcha" in Ahmedabad with Tushar Gandhi. "The video below is of Anhad's programme with Tushar Gandhi in December 2012 ,discussion at various chai ki ketlis in Ahmadabad. The difference of course is by the time we reached the third chai ki ketli RSS sent people to heckle us which of course won't happen with Modi", she said in a statement.